In 1988, Scientific AmeriKen co-authored a science fair project with fellow 5th grader Salvadore Medina. The project investigated the use of salt water while growing plants. The experiment was bestowed an award of honorable mention, however, not for the merits of the work, but as a consolation prize for the experiment being mistaken as the work of a first grader and being accidently judged as such. Today, 27 years later, Scientific AmeriKen seeks to build upon this work and show applicability of the methodology as a herbicide against sidewalk and driveway weeds. Even though long term memory is extremely stretched, if correct, salt was very effective at killing plants. Although the original goal of the 5th grade experiment was to be proof-of-concept of a strategy to quell drug operations by dropping salt water from planes onto illegal crops, it is the hypothesis that salt water will acheive the smaller goal of being efficacious against weeds. Table salt (Sodium Chloride) was acquired from Aldi for a total cost of $0.31. The experiment will consist of three parts. The initial part involves the application of saturated salt water on weeds. Salt was added to tap water at its hottest setting (roughly 135F / 57C) until salt would not dissolve. This was then placed liberally on top of the weeds daily over 7 days. Nearby weeds were left unwatered. In the second phase, following the one week salt water treatment, weeds were extracted by hand and the clear space was left untouched for one week. Finally in the third phase, salt was simply piled on top of the weeds and left for one week. Figure 1. 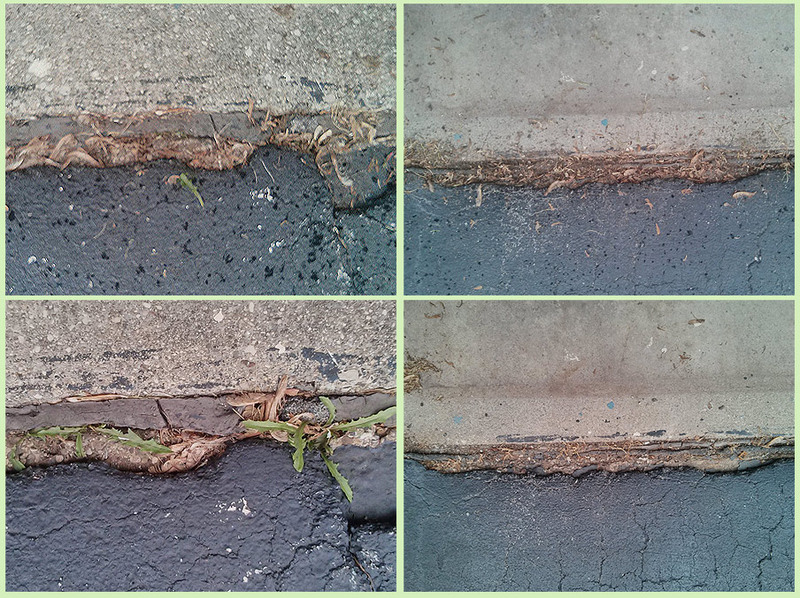 Impacts of daily saturated salt water solution on weeds. Salt was added to hot water (~60 oC) until salt ceased to dissolve. 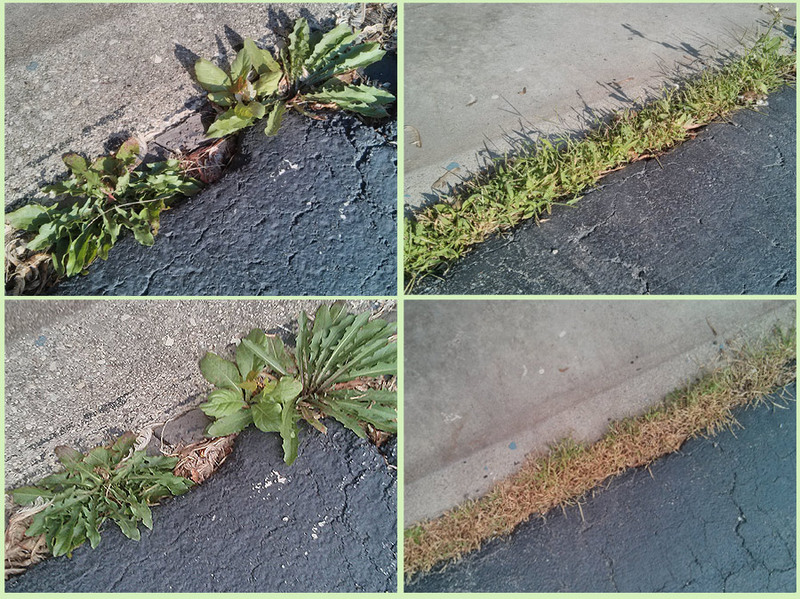 Water was applied to weeds on a daily basis for one week. Figure 2. Recovery following weed extraction. Weeds were removed by hand and vacant spot was left unaltered for a one week period. Figure 3. Impacts of direct application of salt. Pure salt was applied to weeds and left for a period of one week. Scientific AmeriKen has confirmed previous conclusions of 1988 science and weeds succumb easily to the effects of salt. Slightly suprising was the greater success seen with the lazy approach of just dumping salt directly on top of the weeds. Indeed, this solution would be more feasible for drug-war bombers than hauling the weight of the salt water. Further, it is unclear whether a single dose of salt water would have been as effective as a single dose of pure salt. 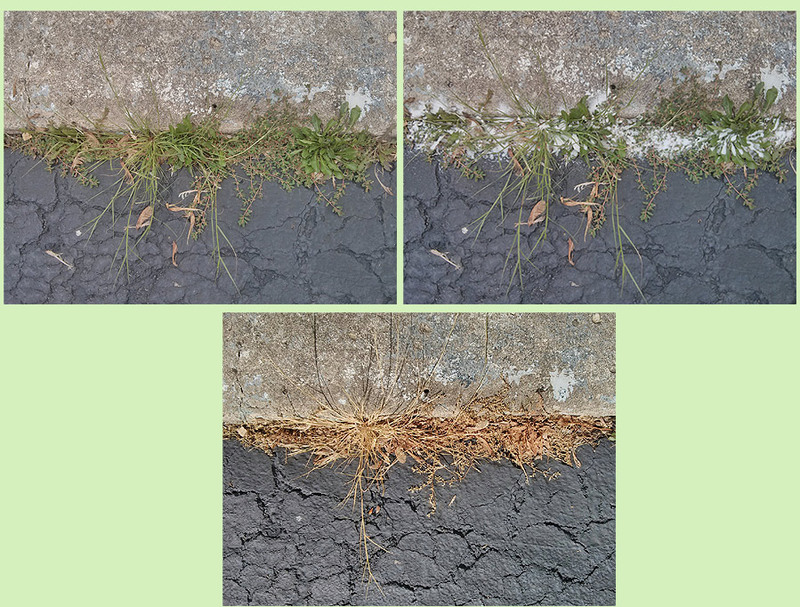 Time will tell how long the salt keeps the spaces bordering driveways and sidewalks free from pesky weeds, but certainly this experiment convincingly demonstrates the merits of this body of scientific work, and further has shown a cheap, effective and safe means of weed control. Discuss thoughts and questions about this experiment at Science Chat Forum today!